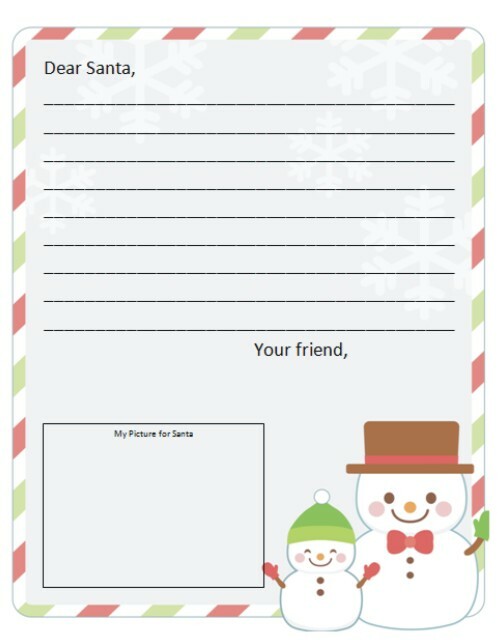 Help your kids write a letter to Santa Claus this year with a free Dear Santa letter template. This free printable Dear Santa letter is formatted as a .pdf file so you can download it and print it at home. Then let the kids have fun! Sending a letter to Santa is a great way for kids to practice their letter writing skills. You can help them learn how to write a courteous letter by encouraging them to ask about Santa before launching into their message. You might also want to suggest that they tell Santa the good things they’ve done or learned this year before making a request for gifts. And at the end, be sure to remind them to thank Santa for his generosity every year. The free Dear Santa letter template also includes a place for your child to draw a picture of himself/herself, your family, a pet, or anything they want to draw. They could also put a photo in this space. After they’ve finished the letter, you can teach them how to address an envelope, and then let them know you’ll put it in the mailbox. Don’t forget to save a copy to enjoy later! These letters to Santa can become precious keepsakes. Then be sure to come back here to Free Santa Letters Online.com to make sure Santa responds!